Our Centenary Badge, designed by one of our Scouts. 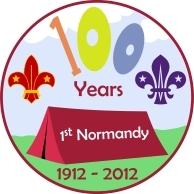 Between September 2011 and August 2012, 1st Normandy Scout Group celebrated its 100th anniversary. We would still be interested to hear from any old Scouts and Scouters. 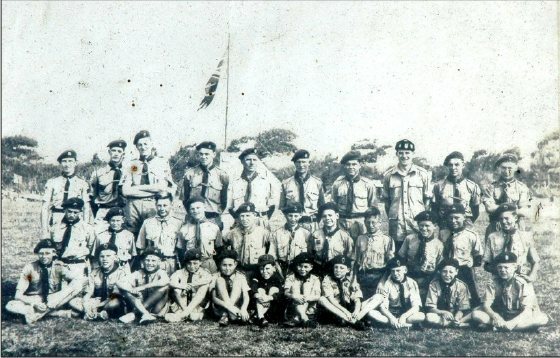 Do you know any of the Scouts in this picture? If so please get in touch. We are currently fundraising in order to renovate the toilet and kitchen facilities in our hut – you can donate online at our MyDonate fundraising page. 2012 was Akela’s (Alexis Shirtliff) 25th year as a Scout having joined 1st Normandy Cubs in 1987 – to celebrate this he aimed to run 26 races (including a marathon) throughout the year. By the end of 2012 he had run 24 races of between 10K and full marathon distance, (28 if you count 5Ks), and in the process raised over £500 for the group. We are currently raising funds to refurbish the toilets and kitchen in our Scout hut.